After 12 years in the UK, Bristol resident Abdul Huq Moughane was due to be deported from London to Morocco on Monday 31st January. Moughane left Morocco after having been imprisoned, tortured and falsely accused of writing graffiti insulting the King in 1994. He had been imprisoned for eight months, had electric shocks in his head, and screws attached to him so that every time he moved they dug deeper into his body. He still has the scars. On contemplating his return, his face contorted with fear, he says, ‘if I thought I would face a short time of torture, I could manage, I have come through that before. But if they hear I tried to claim asylum abroad, I will never see the sun again’. After 12 years in the UK, Moughane has a wide circle of friends and supporters. ‘I will do all I can to prevent Moughane being snatched from us, he is like part of our family’, says Louisa Maynard, 29 year old drama therapist. ‘My 3 year old son always looks forward to playing with Moughane. When I try to explain where Moughane is, my son asks ‘but why?’ There is no answer I can give’, says Rebecca Yeo, 44 year old researcher. Six Bristolians travelled to Heathrow to speak to passengers scheduled on the same flight as Moughane. Passengers were overwhelmingly supportive, many agreeing to talk to the crew and to refuse to fly with Moughane on board. Other supporters were ringing the airline, contacting MPs, looking for solicitors, and demonstrating support at College Green. Despite all these efforts Moughane was taken onto the plane. He began shouting for help, struggling in his handcuffs, severely injuring his arm. At last, just moments before take off, the pilot announced he would not carry Moughane. He was taken off the plane and back to the detention centre. The threat of deportation has not gone. He has been told he will be removed same time next week. Friends and supporters are working round the clock to find him legal help and prevent the removal. Moughane left Morocco after having been imprisoned for eight months, and accused of writing graffiti insulting the King in 1994. On contemplating his return, his face contorted with fear, he says, ‘if I thought I would face a short time of torture, I could manage, I have come through that before. But when they hear I tried to claim asylum abroad, I would never see the sun again’. Moughane’s parents died in 2000, and he was unable to see them before they died. His brother committed suicide in Morocco in 2010. He is no longer in contact with any friends or family in Morocco. After 13 years in the UK, Moughane has a wide circle of friends and supporters of all ages and backgrounds. ‘It is so unjust that Moughane is being snatched from us, he is like part of our family’ says Louisa Maynard, 29 year old drama therapist. 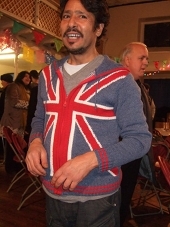 Support Moughane and his campaigners in his fight to stay in the UK. One of the UNISON members picked up, who was traumatised by the clandestine nature of the raid and the appearance of around 40 officers in full body armour, arrived back in Bogota, 48 hours after the raid, wearing the same clothes she was arrested in and with 75pence in her pocket. Disorientated and distressed, she was simply dumped in Bogota—hundreds of miles from her home town without any concern as to how she could get back to her family. Another of the nine, Rosa Perez, was deported on Tuesday 30th without being given the 72 hours notice that is required—she had no chance to say goodbye to workmates who had been visiting her in detention or to receive the collections that SOAS staff had been making to help with her return. One of the nine, Marina Silva, remains in detention at Yarlswood—where detainees are on hunger strikes and other forms of protest because of the appalling conditions and the decision to freeze their bank accounts, which contain all the wages earned at hard jobs like cleaning or fruit picking. Marina, who is 63, has claimed asylum because her husband was murdered in an honour killing at home and she was threatened until she left. Having lost the breadwinner and in fear, Marina eventually came to live and work in the UK a few years ago. She is very frightened in Yarlswood where her detention disrupted medical tests. They are joined inside by other workers who have been set up in a similar way. In one case at the Picadiily Backpacker hotel in London on June 17, six members of staff were trapped by UKBA on the sixth floor. The five men were taken away and made to sign a document without understanding it. They were then deported without being able to take any possessions, access their money or contact their families. The remaining worker is at Yarls Wood. You can copy/amend this or write your own version. (No Home Office reference numbers but fax anyway). 2. Ring your MP and express your concern for these individuals and ask them to pass on the message to Alan Johnson. You can get your MPs details from http://www.theyworkforyou.com or ring 020 7219 3000 and ask for their office. Your MP can ask a question about this or can lay down an early day motion. Students and allies at the University of London’s School of School of Oriental and African Studies (SOAS) have occupied the university today to protest against managers’ attacks on migrant workers. Nine cleaners from the university were taken into detention after a dawn raid by immigration police on Friday. Five have already been deported, and the others could face deportation within days. One has had a suspected heart attack and was denied access to medical assistance and even water. One was over 6 months pregnant. Many have families who have no idea of their whereabouts. The cleaners won the London Living Wage and trade union representation after a successful “Justice for Cleaners” campaign that united workers of all backgrounds and student activists. Activists believe the raid is managers’ “revenge” for the campaign. Immigration officers were called in by cleaning contractor ISS, even though it has employed many of the cleaners for years. Cleaning staff were told to attend an ‘emergency staff meeting’ at 6.30am on Friday (June 12). This was used as a false pretext to lure the cleaners into a closed space from which the immigration officers were hiding to arrest them. More than 40 officers were dressed in full riot gear and aggressively undertook interrogations and then escorted them to the detention centre. Neither legal representation nor union support were present due to the secrecy surrounding the action. Many were unable to communicate let alone fully understand what was taking place due to the denial of interpreters. SOAS management were complicit in the immigration raid by enabling the officers to hide in the meeting room beforehand and giving no warning to them. The cleaners were interviewed one by one. They were allowed no legal or trade union representation, or even a translator (many are native Spanish speakers). The cleaners are members of the Unison union at SOAS. They recently went out on strike (Thursday 28 May) to protest the sacking of cleaner and union activist Jose Stalin Bermudez. 1. We call on the directorate to request the secretary of state to immediately release the detainees and to prevent the deportation of the three cleaners who are still in detention in the UK. 2. For the directorate to release a public statement condemning what has happened to the SOAS cleaners and calling for their immediate release and return. 3. To campaign for the return of the cleaners who have already been deported. 4. To bring all contract staff in house. SOAS should not use contractors, ISS or others. 5. To keep immigration officers from entering campus under ANY circumstances or other forms of collaboration with immigration or police. Universities are for education not for state violence and oppression. 6. A year’s wage as reparations for all detained and deported staff. 7. To hold accountable SOAS managers who were complicit in facilitating the raid and detention of the cleaners, refusing to aid a sick worker and a pregnant woman. 8. To reinstate Jose Stalin Bermudez, the SOAS UNISON branch chair. 9. To respect the right to organise in Trade Unions unimpeded. 10. To provide space and resources for a public meeting to build support for the SOAS 9 and other migrants, in education and beyond, affected by immigration control and racism. 11. Amnesty for all those involved. “Our fight has united lecturers, staff and students and has rocked SOAS management. Those managers are now lashing out. The campaign to stop the deportation is supported by Tony Benn, MPs John McDonnell and Jeremy Corbyn, film director Ken Loach, and many trade unionists and student activists. “As living wage campaigns are building in strength, we are increasingly seeing the use of immigration statuses to attack workers fighting against poverty wages and break trade union organising. “This raid is the action of a bully. Migrant workers are amongst the most vulnerable – poorly paid and far from home. The current occupation is a reflection of broad outrage against these actions by all sectors of society. This raid is widely seen as a continuation of current trends to remove immigrant labour and to maintain impossibly low wages. Cleaning contractor ISS used the same tactics against tube cleaners that went on strike with the result that key activists were deported. The use of immigration law is bering used for union busting. On the 11th of april 2009 eighty activists blocked the gate of the Steenokkerzeel detention centre in (Belgium). The action started at 5:30 AM, when activists from across the country found their way through the fields surrounding the detention centre, and blocked the gates. The action ended around 11:30 AM when the last activists were removed by the police. Because of the blockade, no refugees could be taken to the airport, no refugees could be brought to the closed detention centre. Around six o’clock the activists found out that the first deportation planned that day was cancelled and another policevan with a refugee on board, couldn’t leave the centre. The police was present after ten minutes, but had a lot of problems to find the right equipement to release people from the lock-ons. After the action police ID checked the activists, eight people remained anonymous and were held in the police station for 12 hours after being released. They haven’t done anything wrong. Last Month, five Latin American cleaners were unfairly dismissed by the company responsible for the cleaning at the National Physical Laboratory. 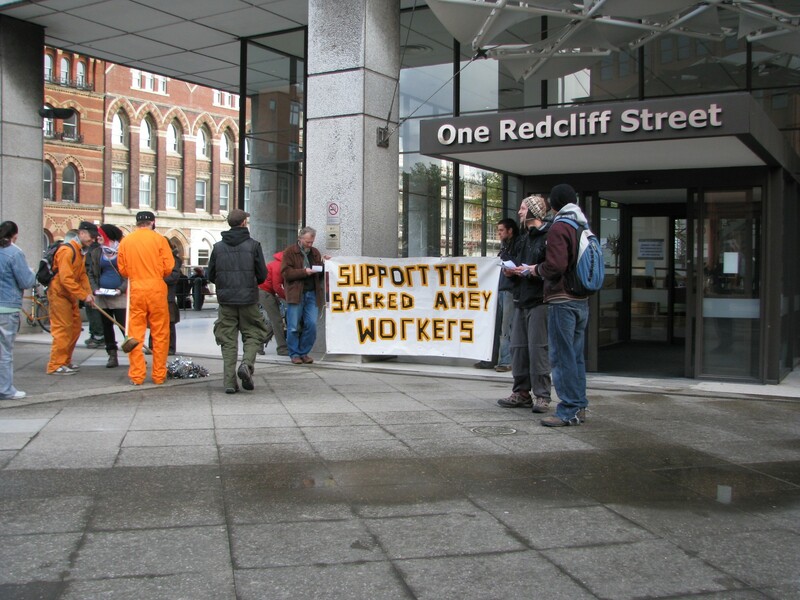 Their sacking was a clear retaliation to their attempts at organising, receiving union recognition, and protesting the measures by which Amey has, since taking over the contract in 2006, been lowering their standards. Among the acts of intimidation carried out by Amey, there was a migration raid at NPL that resulted in seven dismissals and three deportations. Noisy Picket:Friday, 21st November at: 1 Redcliffe Street,Bristol between 12.00pm and 2.00pm Please bring noisy things. This follows several demos in London, and one last month in Bristol. There will also be a public meeting in Oxford on Thu Dec 4 and and action at Amey national HQ, also in Oxford, on Mon Dec 8. Transport will probably be available from Bristol for the demo . 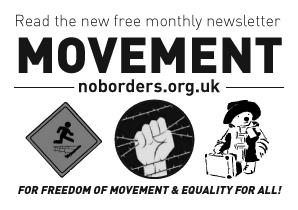 e-mail bristolnoborders@riseup.net if your interested in going and want further details. Bristol No Borders call for solidarity with all workers whether they have papers or not. We are aware that this is a tricky time to defend migrant worker’s rights, as many fear losing their own jobs and the media stir up talk of putting limits on immigration to protect ‘British’ jobs. But we think this is the right time to be making the arguments that we will not be divided by bosses and governments. This is ultimately more than just a matter of rights and fair treatment for migrant workers – it’s about the “race to the bottom” that determines deregulation, worse pay and standards for all workers in the UK. Migration controls are a weapon against the whole work force. They divide us and are a tool of discipline the workforce. If there are workers with less right or no rights, this undermines the position of workers as a whole. Migration legislation is unlikely to to stop so called “illegal workers” from seeking employment in the rich west. It will however, employers probably hope that it will make them less likely to organise at work, this allowing employers to further reduce their working conditions. The answer must be to oppose immigration controls. EQUAL RIGHTS ARE IN THE INTERESTS OF ALL WORKERS. 2-3 pm outside Tesco Metro in Broadmead to protest against vouchers for asylum seekers, and encourage exchange of vouchers. food, transport, even to top up mobile phones.